February 1, 2013 By Allyson 16 Comments This post may contain affiliate links. Read my disclosure policy. We are only 2 days away from the Super Bowl, and we are going to conclude our 3 part Super Bowl series with some yummy treats! I know everyone is all about the dips, appetizers, wings, and drinks on Super Bowl Sunday, but who doesn’t love to end the game with something sweet and delicious!? Here are 7 options that are sure to please! Upon first inspection, you would never guess that there are delicious Oreos underneath this layer of chocolate, but there are! Chocolate covered Oreos? Yes, please! 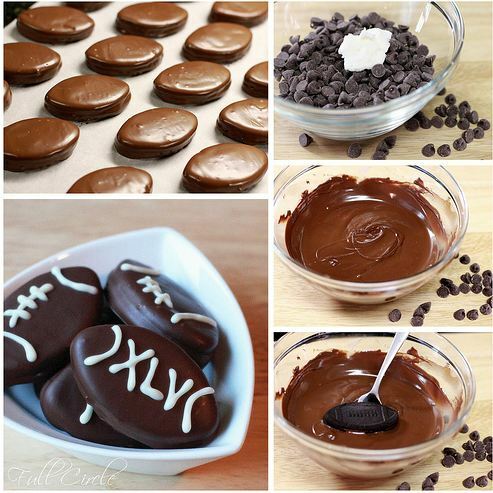 Oh, and don’t forget to update the Super Bowl number if you make these (XLVII)! How about a classic Peanut Butter Cookie for the Super Bowl? 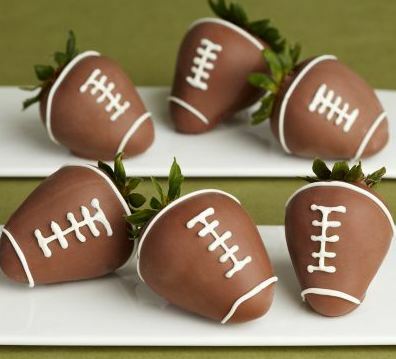 These tasty treats are topped with chocolate frosting and shaped like footballs. Betty Crocker definitely got this one right! Mmmm, next on the list is my favorite, brownies! Who can ever say no to the perfectly chewy, chocolate-y brownie? Not me, that’s for sure. Shape these like little footballs and you are good to go! 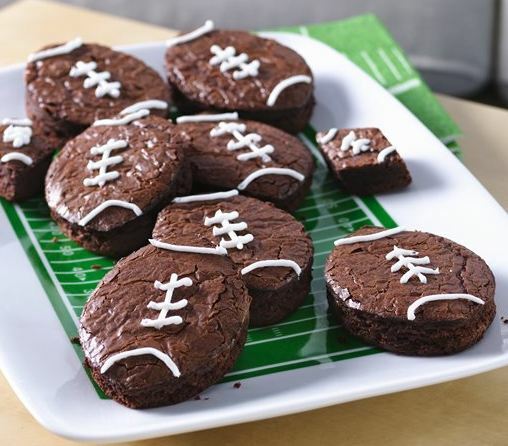 Another idea could be to bring a pan of brownies, and decorate it like a football field! Not into brownies or cookies? 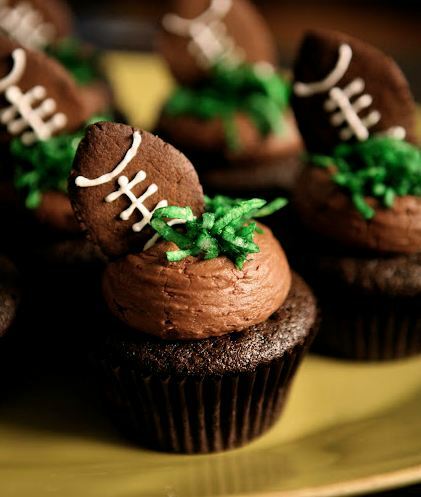 How about some Football Themed Chocolate Cupcakes? The Mini Baker topped these cute cupcakes with a little football gingerbread cookie! It’s like 2 treats in 1…. How creative and cute! 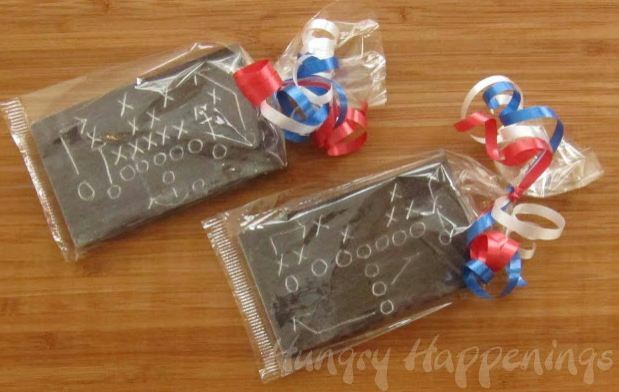 Now, these ‘Football Chocolate Chalkboards’ are probably the coolest thing I have seen so far. Who would guess that the ‘chalk’ to draw on these is made from white chocolate, and the little boards are actually candy bars??!?! Hungry Happenings was on a roll when she thought this up! What a cute favor! 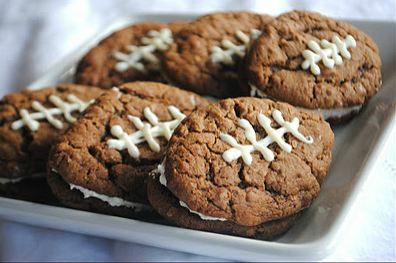 Lastly, Sugary Sweets came up with a Chocolate Oatmeal Cream Pie Football! Although these look difficult to make, she promises they are really easy and super delicious! This looks like a fun one to do with the kids! There we have it, 7 Sweet Super Bowl Treats! If you didn’t see the 15 Super Awesome Super Bowl Appetizers from Monday or the 7 Super Bowl Cocktails, be sure to check those out too! I want the football brownies more than anything in life. I can not stop staring at the brownies! 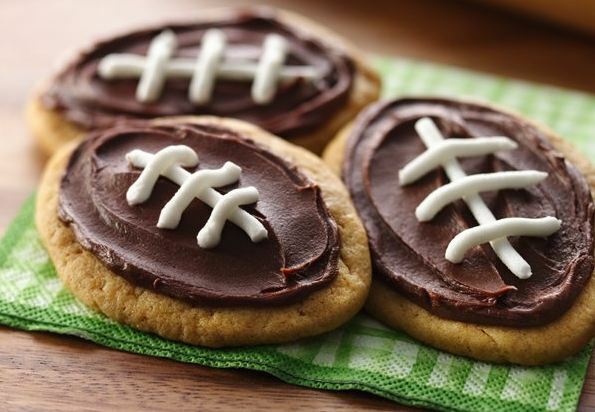 Those football peanut butter cookies look amazing! Your (new?) blog looks amazing. When did you change the layout and switch to self-hosting? Do you mind if I ask if you had help? I’m thinking about making the change myself. Omg, those cupcakes look delicious! I’m making several of your tasty dishes for a party we are going to! Without Your blog I’d have No idea what to bring 🙂 thanks, Allyson! Every one of these are amazing! I wish I had time to make them all, haha! 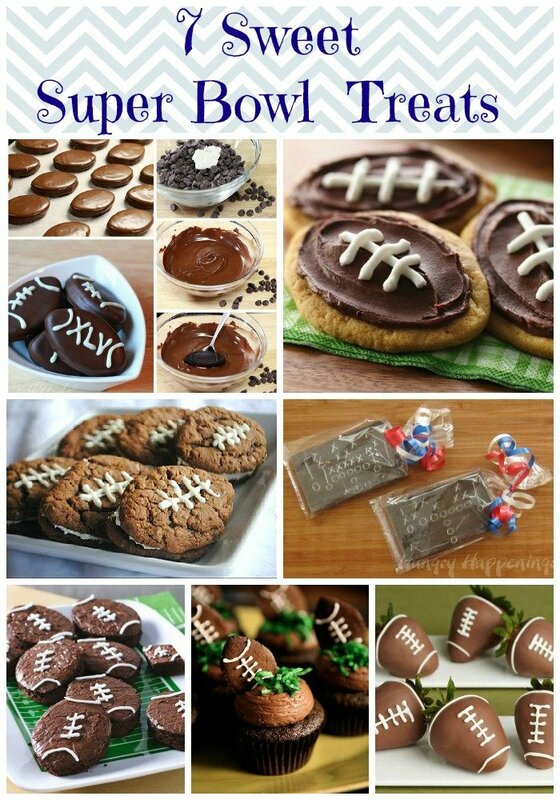 The Peanut Butter Cookies shaped like footballs are awesome! The Football Chocolate Chalkboards are so cool! Those oatmeal cream pie footballs are looking really good to me!